Small Prefab Homes Nigeria - Low Cost Small Metal Building. Great Price. Small Prefab Homes Nigeria - Low Cost Small Metal Building. Built To Customers' Specifications. Delivered Within Days. Great Price. Small prefab homes have unique benefits. First, small prefab homes are pocket friendly because they cost far less than large apartments or big houses. Therefore, if you're on budget or a low income earner, your best choice will be to order one of our small metal building (or small prefab buildings). The second advantage of small metal building is this . . . they consume minimum space. Consequently, small prefabricated houses are ideal for use as security lodge, servant quarters, drivers' lodge . . . and more. 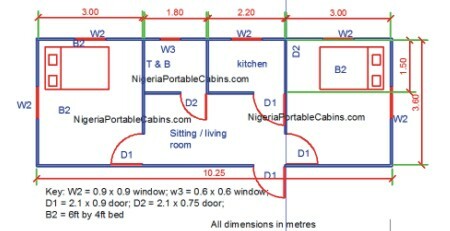 So, if you have been thinking of building a separate house or boys quarters for your driver and other house helps, look no further. Simply request a quote for a small prefab home and we will deliver it to you within two weeks. This saves you the stress of turning your home into a construction site and managing several construction workers just because you wish to construct living quarters for your house helps. This highlights another benefit that comes your way when you order our small metal building or any class of steel homes from us. When you order any of small metal buildings or portable homes, we will deliver the completed prefab or metal building to your preferred destination . . . and right on time. Yes, you simply pay for the prefab building and forget it. We will deliver the building to you within 2 weeks of confirmation of your payment. Small Metal Buildings - Just How Small? You're probably wondering, "what constitutes a small prefab home? How small is a small metal building?" A small steel home can be as small as you want it to be. In fact, how small the small prefab building is designed to be is dependent on the buyer. And the buyer's decision with respect to size is driven by whether the buyer wishes to live in it or wishes to accommodate his workers in it. 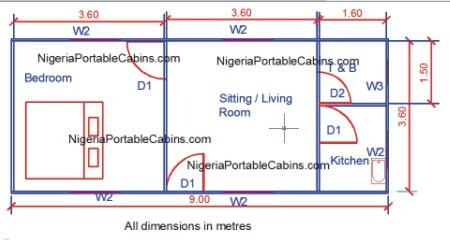 For example, a home owner who wishes to buy a small prefab building for personal residence will want a toilet and kitchenette included in the building whereas the same buyer may not deem it fit to include a toilet and kitchenette for a steel house or metal building to be occupied by his driver or maid. In simple words . . . the small metal building can be as small or as big as you want it to be. You just tell us exactly what you want when you request a quote and we will build to your taste and budget. Small Steel Buildings - The Perfect Choice For Becoming A Home Owner Fast! In the previous section we talked about how you can get a factory built home for your servants and house helps pretty fast . . . within days. It's not only house helps and personal stewards who need new accommodation super fast. Our small portable prefab homes service is for everyone . . . including YOU. Is your landlord giving you headache? Do you wish to become a home owner or landlord super fast . . . and without the associated construction headaches? If your answer is yes, then you should buy one of our small prefab homes . . . if you're on budget. If you're not on budget . . . if you have plenty of cash to spare . . . then you should buy one of our luxury prefab homes. We will deliver the small steel building to you within two weeks of confirmation of your payment. Yes, your home will be ready within two weeks! All you need to do is place your order and then go in search of a piece of land to buy in your preferred neighbourhood. Your small metal building or prefab home will be ready even before you secure your land. Then simply tell us where you want us to deliver the building. Tired of the non-sense and insults from your landlord? Want peace of mind and a stress-free life? Want to become a landlord fast? Click HERE to request a quote and become a landlord within two weeks.